SPACEPORT NEWS Page 3 August 16, 1996 Editor's note: The following letter was received by Center Director Jay Honeycutt in appreciation for Kennedy Space Center's contribution to the Olympic Torch Relay. Dear Jay: I would like to commend you for your Centers efforts in supporting the Olympic Committee and for the July 7, 1996, ceremony commemorating the Olympic torchs return with the STS78 crew and the torchs route through KSC. The entire event was extremely well organized and representative of the professionalism that this nation has come to expect from NASA and KSC. Due specifically to the enthusiasm and dedication of the KSC team, the Olympic torch run was made even more memorable by scenes of this ancient ritual passing in front of Atlantis, one of Americas national assets. Please extend my appreciation to your team for doing such a spectacular job in representing all of NASA. Sincerely, Daniel S. Goldin Goldin appreciative of KSC's Olympic effort Employees invited to view Rolling Stones IMAX film Kennedy Space Center employees will get the satisfaction of seeing The Rolling Stones At the MAX at the Visitor Center IMAX 1 Theater. Delaware North, the KSC Visitor Center concessioner, is providing special free showings for KSC employees and their families from Sept. 5 8 at 7 and 9 p.m. each evening. Tickets for the employee showings will be distributed through Space Flight Awareness representatives the week of Aug. 26. Shot on location in Turin, Berlin and London, the film features the electrifying Stones during the bands record-breaking 1989/90 Steel Wheels/Urban Jungle tour. The Rolling Stones movie is the not only the first IMAX concert film but is also the first feature-length film in the format which provides an overwhelming 90minute experience. Shows will be available to the general public for the three remaining weekends in September each Friday, Saturday and Sunday at 6:30 p.m. for a ticket price of $9. N ewcomers to Florida sometimes have trouble understanding the fascination many residents hold for manatees -those bulbous creatures that congregate in the state's waterways and can make boating down a channel comparable to negotiating an obstacle course. Jane Provancha, an ecologist with Kennedy Space Centers (KSC) Life Sciences Support Contractor, the Dynamac Corporation, has a message for those people -protecting the manatee is an essential part of preserving the resources that drew them here. Provancha, who was recently selected to lead a Manatee Geographic Information System (GIS) Working Group to coordinate information on manatees for the public and private sector, preaches a simple message. Every part of the circle of life makes a vital contribution to the whole. When manatees, which are currently categorized as endangered, become extinct, the waterways that now contain them will also be at risk. "Manatees are a small part of the big picture," said Provancha, who leads KSCs Aquatics Group. KSC has an advantage in conducting research on the mammals because they are naturally drawn to the warm waters of the Indian and Banana rivers. "This is the most important hub for manatees on the east cost of Florida," Provancha said. A manatee rehabilitation program, which was started in 1994 in the Banana River off the NASA Causeway, gave the biologists a chance to learn more about the mammals and the seagrasses they live on. The death JANE PROVANCHA says the manatee working group she is heading will assist conservation efforts through shared resources. of seagrass in the pens has resulted in the cessation of the project but it offers researchers the opportunity to gain valuable information about the interdependence between the grass and its surroundings. Florida residents need to realize the fragile state of the ecosystem and the toll years of development and neglect have taken, she said. S he said the Manatee GIS Working Group, formed in 1989, will help conservation efforts through rapid communication and data sharing among scientists from federal and state agencies, academia and the boating industry. The group works with the Florida Department of Environmental Protection and uses the GIS computerized method for analyzing the ecology of any given area. All the known data that affect an area's health are combined on a high resolution map allowing scientists to show how a combination of factors affect interactions. The group is planning an Internet web site and will soon publish a CD-ROM that will serve as an atlas of marine resources. It provides a service to any group concerned with the manatee problems through its network of contacts in the field. "We're hoping the information we generate can help other agencies and individuals protect all our valuable resources," Provancha said. Page 4 SPACEPORT NEWS K ennedy Space Center, the nations gateway to the stars, will soon have a starring role of its own in the Mary Tyler Moore television production The Cape. The pilot movie, to be followed by a 20-episode television series is scheduled to air this fall on WKCF (channel 18). Beginning last spring, MTM production staff traversed KSC in search of the camera shots and angles that would help them create an authentic picture of astronauts and hardware being prepared for launch. Executive Producer Kary Antholis, who recently won an Academy Award for his work on a documentary about the Holocaust, said he was intrigued by the concept because of the potential for telling a fantastic story about people doing heroic things in awe-inspiring surroundings. Getting equipment and huge crews to those surroundings sometimes proved overwhelming, Antholis said. The support of KSC management and assistance by employees throughout the center helped clear some of the logistical hurdles. Filming began in May. Sites that are routinely us for real-life launches, inclu ing Firing Room 1, the Astronaut Quarters at the Operations and Checkout Building, and the catwalks Pad B were bathed in ligh and wired with sound equ ment in an effort to accen ate their authenticity for th camera. Trailers for equip ment, cast, wardrobe and food followed the product crew around the center. KSC employees servin as extras, some in roles t work in every day, were scrutinized for authenticity LAUNCH DIRECTOR Jim Harrington is made up by makeup artist Diane Maurno. Harrington portrays himself in the movie pilot. COSTUME SUPERVISOR Michael Safier gives directions to extras, carrying the clothing they will wear during filming, in the Launch Control Center lobby. SERIES STARS Adam Baldwin, Cameron Bancroft, Bobbi Phillips and Bobby Hosea are filmed during a running scene near the Astronaut's Beach House at Kennedy Space Center. ABOVE, Launch Director Jim Harrington and Assistant Launch Director Al Sofge test the flight deck of the simulated orbiter built by Mary Tyler Moore Productions for the movie. At right a NASA T-38 is prepared for filming at the Shuttle Landing Facility. SPACEPORT NEWS Page 5 t filming locations, inse television programg was replaced by videos ring to the fictional Cape sion. S uch meticulous attention to detail essed even those whose dards are non-negotiable n it comes to Shuttle ches. Launch Director Harrington and Assistant nch Director Al Sofge ed other KSC officials in ng the model cockpit sed by the Cape to ulate the actual item. y both gave the mock-up lid thumbs up. Antholis said cast and crew members couldnt help but absorb the sense of shared satsifaction on center after viewing the launch of Columbia on STS-78 June 20. We hope to draw attention to the endeavors of men and women who escape the bonds of Earths gravity to explore the unknown, he said. The spirit of the space program is what he hopes the program conveys to the public. PANELS ARE CLOSED on the Firing Room 1 windows to simulate a night launch. STUNT DIRECTOR Jim Vickers assists actress Tyra Ferrell prepare for a scene during which she is training for an extravehicular activity. Page 6 SPACEPORT NEWS August 16, 1996 Professional secretaries group to install officers on August 27 Employees can take advantage of area theme park discounts Kennedy Space Center employees can take advantage of the following specials at area theme parks: DISNEY Blizzard Beach Special Admission price at Disney's newest water park for Sept. 7 or 8 is $22.50 which includes a meal ticket and unlimited soft drinks from 10 a.m. 5 p.m. Regular admission price without food or drinks is $25.39. Tickets will go on sale at all NASA Exchange Retail Stores on Aug. 26. UNIVERSAL For the entire month of September, KSC employees and families can visit and enjoy Universal Studios for $23/adults and $18/children (ages 3-9). Regular prices are $38.50 plus tax/adult; $31 plus tax/children. Tickets will go on sale at all NASA Exchange Retail Stores on Aug. 26. SEA WORLD For the entire month of October, Sea World tickets will be on sale in the NASA Exchange Retail stores for just $25 (adult and children same price). Regular price for admission is $39.95/ adult and $32.80/children. Tickets will go on sale Sept. 23. Most KSC Rockwell employees to continue transition to USA despite Boeing purchase Although The Boeing Company recently agreed to purchase Rockwell International Corporations aerospace and defense units, most employees of Rockwells Space Systems Division will continue transitioning this fall to another new venture The United Space Alliance (USA). Approximately 800 of the 1,100 Rockwell Space Systems employees at Kennedy Space Center will become USA employees on Oct. 1, said Bob Tucker, Rockwell spokesman. The remainder will become part of Boeings new subsidiary, Boeing North American, Inc., sometime in November. Also joining the Boeing venture will be 130 Rocketdyne employees at KSC. Boeing and Rockwell announced the agreement Aug. 1, under which Boeing will acquire nine Rockwell businesses for $3.2 billion. The deal also includes 50 percent of USA which will be shared with Lockheed Martin. Wilbur Trafton, NASA associate administrator for Space Flight, emphasized that the agreement will have no impact on discussions between NASA and USA in preparation for USAs transition to the role of single prime contractor for Shuttle operations. Negotiations with Kent Black (chief executive officer of USA) and his USA organization are continuing as planned. Finalizing the details of the Boeing/Rockwell merger will take several more months and we will of course pay close attention to areas that involve or impact NASA. It is still our hope and expectation to sign the Shuttle single-prime contract with USA in the October time frame, Trafton said in a statement. Rockwells Rocketdyne division prepares and processes the Space Shuttle main engines for launch. The Space Systems Division holds the KSC logistics contract and provides support engineering for the space center. The sale will help Rockwell shift its emphasis to highergrowth commercial and international businesses, specifically the area of electronics, said Donald Beall, Rockwell chairman and chief executive officer. Rockwells automation, avionics and communications, semiconductor systems and automotive components businesses, leading global competitors with strong market positions, just got stronger, he said. Phil Condit, Boeing president and chief executive officer, said, The assets and capabilities we are acquiring are an extremely good strategic fit with our longterm objective of creating stockholder value. This merger accelerates us on our way to achieving our 20-year vision, which calls for Boeing to be a fully integrated aerospace company designing, producing and supporting commercial airplanes, defense systems, and defense and space systems." Condit emphasized that the intention of the acquisition is to expand the companys business base and opportunities. He said he expects minimal impact on existing jobs. My desire, Condit said, is to absorb any necessary employment adjustments through normal attrition and by retraining employees to take advantage of new business or career opportunities within Boeing. Both of our organizations have records of strong performance and we expect to learn best new practices that will bring increased product value to our customers. 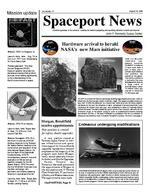 Correction A photo caption in the Aug. 2 edition of Spaceport News misidentified the school that will be participating in an internship program established by the Administration Office's University Programs division. Bethune Cookman College is the participating school. Administrative Support personnel at Kennedy Space Center have an opportunity to keep current with everchanging requirements in their profession by joining an organization being offered for the first time on center. The Space Coast Chapter of Professional Secretaries International (PSI), which held its first meeting in June, serves to keep secretaries up to date on business trends and technology and to strengthen the image of the profession. Officers of the KSC chapter will be installed Aug. 27 at 9 a.m. at the Mission Briefing Room in the Operations and Checkout Building. Supervisors, senior management and all NASA and contractor secretaries are invited to attend the reception. Peggy Parrish, chapter president, said her goals for the KSC chapter are to enhance the image of all office support professionals through educational seminars, networking, and the Certified Professional Secretary (CPS) program. Other officers are Karen Jansma, vice president, and Sherry Russo, secretary. The chapter, which meets on the second Wednesday of each month at 11:30 a.m. in Headquarters Room 2201, sponsors a variety of careerenhancing activities from training in leadership and presentation skills to participation in professional development courses and the opportunity to earn Continuing Education Units toward maintaining the Certified Professional Secretary certification. Joy Colston, president of NASAs senior secretary council, said the affiliation offers wonderful opportunities for training, improvement and networking. Civil service and contractor employees are welcome to join. For more information contact Peggy Parrish at 8677208. John F. Kennedy Space Center Spaceport News The Spaceport News is an official publication of the Kennedy Space Center and is published on alternate Fridays by the Public Affairs Office in the interest of KSC civil service and contractor employees. Contributions are welcome and should be submitted two weeks before publication to the Media Services Branch, PA-MSB. E-mail submissions can be sent to Barbara.Compton-1@kmail.ksc.nasa.gov Managing editor. . . . . . . . . . . . . . . . . . Lisa Malone Editor. . . . . . . . . . . . . . . . . . . . . .Barb Compton Editorial support provided by Sherikon Space Systems Inc. writers group. USGPO: 733-096/20027 SPACEPORT NEWS August 16, 199 6 Page 8 Position. . (Continued from Page 1) subject to final approval by NASA Headquarters. In her newly established position, Morgan will be responsible for insuring that KSC infrastructure and KSC operational procedures match improvements to the Shuttle flight systems. Working agency-wide In describing the position, Honeycutt said Morgan will be working closely with NASA Headquarters, the Johnson Space Center, the Marshall Space Flight Center and others to insure that proposed upgrades to the Shuttle will streamline the processing done at KSC for launch while maintaining the safety of flight. Morgan, who will report to Honeycutt, said she will be working with all directorates at KSC as well as with Shuttle program leaders throughout the agency. She said her initial focus will be on establishing good integration with designers in Houston, making sure planned improvements enhance Shuttle operability and reduce costs and that safety remains in the forefront. Next to address are infrastructure improvements. This is a great opportunity for NASA engineers to get some hands-on experience in new systems, she said. From a practical standpoint the Shuttle will have flown 20 years by 2001. Were looking ahead at making changes in design and systems to improve efficiency while maintaining or imrpving safety in the years ahead, she said. Specific KSC upgrade ideas will be examined during a strategy sessions next month, she said. Morgan has served as director of the Safety and Mission Assurance Directorate at KSC for the past 2-1/2 years. During the previous 10 years, she worked in the Payload Processing Directorate, where she managed payload projects and ground operations. During her more than 30 years in U.S. human space flight programs, Morgan contributed to the success of programs ranging from Mercury through the Space Shuttle. Breakfield takes new role As the new director for Safety and Mission Assurance, Breakfield will have overall responsibility for KSCs safety, reliability, maintainability, quality and mission assurance programs. He has served as director, Payload Flight Systems at KSC since 1985. Breakfield joined NASA in 1964 and was involved in KSCs development of real-time guidance and navigation data processing software for Saturn launch vehicles and Apollo launch data systems. He has served as chief of the Shuttle Launch Processing Division, chief of the Shuttle Guidance, Navigation and Digital Systems Division and deputy director of Shuttle Engineering at KSC. In his most recent assignment, Breakfield has been involved in coordination and planning of payload processing and engineering support for the Space Shuttle. Experience awarded In announcing the appointments, Honeycutt congratulated both KSC executives on their new assignments. JoAnn Morgan is the ideal person to take charge of KSC activities in support of the Shuttle upgrade effort, he said. Her long experience in project management and her recent leadership of our safety program are an ideal combination for successful support of this critical NASA initiative. Honeycutt added: Tom Breakfield is one of the most highly respected managers in the agency. His leadership will ensure continued success of the safety and mission assurance programs at KSC. Royal visit CROWN PRINCE Dipendra of Nepal visits with Center Director Jay Honeycutt on July 30. The prince and his party toured the Shuttle Landing Facility, the Orbiter Processing Facility, the Vehicle Assembly Building, Launch Pad A and the KSC Visitor Center. Heart attack emphasizes importance of CPR Thanks to the quick actions of two KSC employees trained in CPR, a third employee was recently resuscitated following a heart attack recently. Capt. Larry Fallon of EG&G Fire Services commended Christy Matthews of EG&G and Matt Atkinson of McDonnell Douglas for their immediate response and KSC firefighters who continued life saving efforts at the scene. Fallon said the incident stresses the benefits gained through proper use of the life-saving technique. O&C exercise facility to host open house The exercise facility at the Operations and Checkout Building will celebrate the acquisition of top-of-the-line Cybex strength training equipment with an open house Aug. 30 beginning at 10:30 a.m. In addition to adding new equipment, KSC's original exercise facility has expanded with additional room for working out and an exercise room for aerobics classes. All badged employees can use the exercise facilities with medical clearance.